It all started with a lie for a seatwork in class. 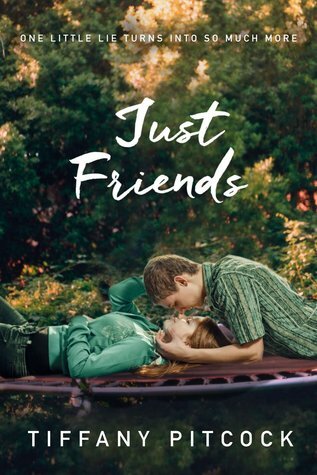 Jenny, our straight-A’s-and-goes-straight-home-after-school-girl, suddenly finds herself with a new fake bestfriend—Chad, the bad boy who your mother probably warned you about. From the moment they started this fake relationship, they automatically “clicked”. It was like they really were meant to be bestfriends but only just that. Basically that’s all you need to know, the plot is predictable but still quite enjoyable (and a bit frustrating). It’s written in a 3rd POV which was quite surprising for a contemporary, and this was one of the reasons why the book didn’t work for me. I struggled to fully connect with the characters even though the writing was adequately descriptive and easy to understand. The overall vibe of the book took me back to my Wattpad days, it’s filled with all these high school clichés—which isn’t actually bad when done right—that were eye-roll worthy. Let’s talk about Jenny and Chad. Jenny at a glance would be one of the leads that I’ll probably love and relate to because she’s that reserved girl who likes to stay at home but we didn’t connect. She kept doing things that I felt that she wasn’t ready for and it was so annoying because she was like a high school girl puppet checking-off stuff from the things-girls-do-in-movies-list, if that makes sense. Chad is branded as a bad boy but was never bad boy enough, in my opinion, because he’s truly a lonely boy inside. The two had instant chemistry from the moment they met, which was kind of unrealistic. The conversations and dialogue was too good to be true and very unlikely to happen in real life. Another thing that I did not like is how all these family conflicts were thrown to the story but were never really resolved. Jenny’s problem with her mom’s dating life wasn’t elaborated further in the end. Chad’s family problems felt like an excuse for him to have the “absent parents trope” so he can be closer to Jenny. What kind of mother just leaves her son alone without prior warning? And before that Chad claims his parents yell at each other 24/7 for no reasons except they don’t agree with each other. That’s clearly a plot device for Chad to sleep at Jenny’s house. And it’s a plot device unsolved because the story solely focus on bringing Jenny and Chad together. My last reason for rating this 2-stars is Luke, the manipulative boyfriend. I hated him and his pettiness. I don’t want to spoil anything for the those of you who’s planning to read this but seeing Jenny with this guy was such a pain. I still can’t wrap my mind around Jenny’s reasons why she kept dating Luke when she clearly didn’t like him. Sighs, I just can’t deal with this. Obviously, I do not recommend this to anyone. There’s a wide array of great contemporary books out there so don’t waste you’re time on this one. The few cute moments does not make up for its overall blandness. A huge thank you to Macmillan International for sending me an ARC of this book. OMG JM didn’t quite like this one too!